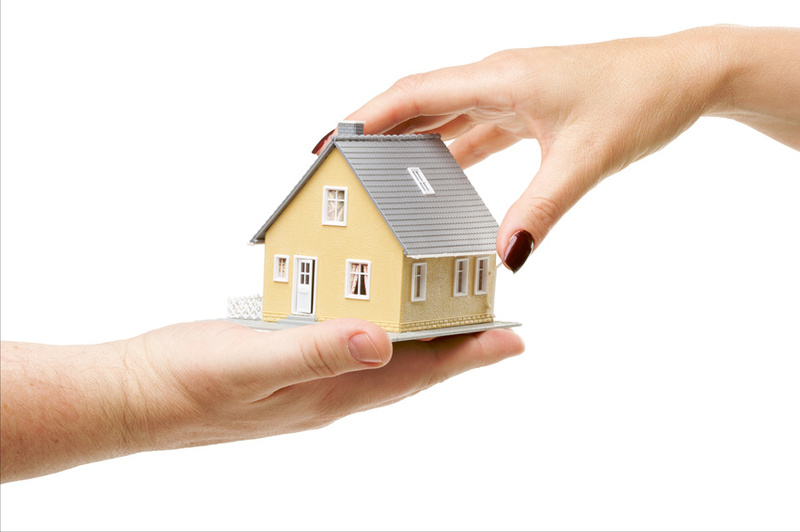 If you or someone you know rent a room, a house, apartment or mobile home, you will want to attend one of these informative presentations on evictions, security deposits, repairs, discrimination, and housing rights for persons with disabilities. The Inland Fair Housing and Mediation Board will be presenting Housing Rights and Responsibilities in nine communities throughout San Bernardino County, for both English and Spanish speakers. If you plan to attend, please click here and RSVP at the number or email at the bottom of the flier. 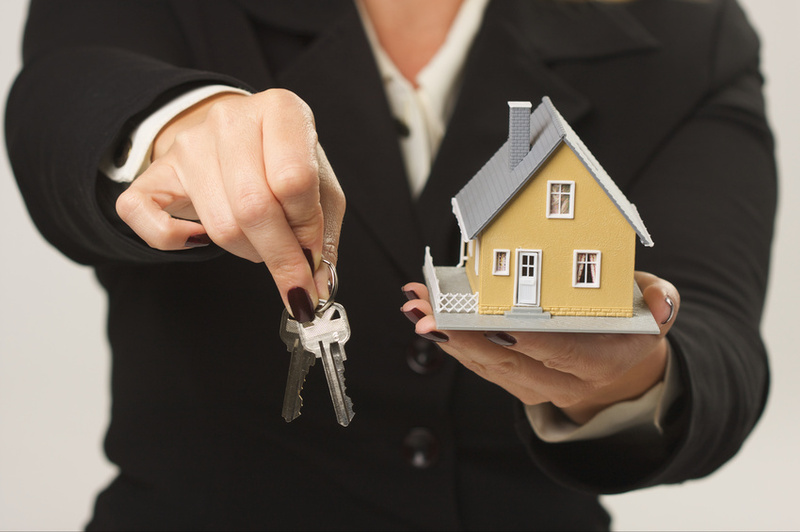 For more information contact the Inland Fair Housing and Mediation Board at 909.984.2254. Special programs for children will be featured at the San Bernardino County Museum on Dinorama Day on Saturday, Oct. 4 between 10 a.m. and 4 p.m. Dinorama Day is presented in conjunction with the museum’s latest special exhibit, “Fossils Underfoot,” in the Hall of Geological Wonders. Activities are included with paid museum admission. Kids of all ages are invited to bring in their own creation: a shoebox diorama featuring dinosaurs that the museum is calling a dinorama. The rules for creating a dinorama are simple: it must be created inside a shoebox; it should be entirely self-contained with no moving parts; and it should not contain organic materials (for example, no real twigs, leaves, or bark). Each dinorama should be marked with the artist’s name and grade in school: preschool; K-4; 5-8; 9 and above. Dinoramas should be delivered to the museum on Friday, Oct. 3 between 3 and 4:30 p.m. They will be put on display for Saturday’s Dinorama Day and remain on exhibit until the end of Dinosaur Discovery Day on Saturday, Oct. 18. Dinorama Day at the museum will also feature craft activities, dinosaur story time, and at 2 p.m. a special dinosaur “kid talk” with Curator of Paleontology Eric Scott. On Monday, Oct. 6, the San Bernardino County Department of Veterans Affairs is conducting a special event to sign up veterans for a County ID card that provides discounts at participating businesses throughout the county. The Victor Valley Transit Authority and Mountain Area Regional Transit Authority boards have approved a 50 percent fare discount to any veteran with the ID. The County Veteran ID card event will be held from 10 a.m. to 2 p.m. at the American Legion Post 584, 41604 Big Bear Boulevard in Big Bear Lake. Veterans should bring an original DD Form 214 or a certified copy showing character of discharge. 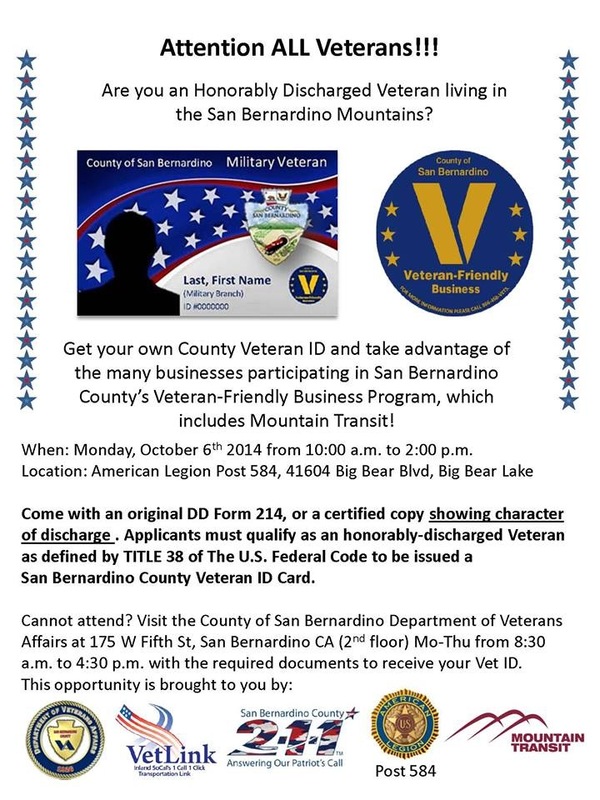 Applicants must qualify as an honorably discharged veteran as defined by Title 38 of the U.S. Federal Code to be issued a San Bernardino County Veteran ID card. Veterans who cannot attend the Oct. 6 event are encouraged to visit the San Bernardino County Department of Veterans Affairs at 175 W. Fifth Street in San Bernardino, second floor, from 8:30 a.m. to 4:30 p.m. Monday through Thursday. As Santa Ana winds and the possibility of wildfires loom on the horizon, the San Bernardino County Fire Department held a press conference on Monday to discuss the new Red Flag Warning program. In an effort to promote wildfire readiness within San Bernardino County, County Fire has implemented the Red Flag Community Notification program. When conditions for extreme fire danger arise and the National Weather Service posts a Fire Weather Watch or a Red Flag Warning, residents will see a red flag flown below the American flag at all County Fire stations within the affected area. Residents will then know to prepare by focusing on preparation and prevention in and around their homes. Deputy Chief Jim Johnstone reiterated that County Fire is poised and prepared to defend life and property within the county. He said, “San Bernardino County Fire has an arsenal of resources readily available. These include our specialized firefighting workforce, gel task force, dozers, hand crews, and a partnership with the Sheriff’s Department for water dropping helicopters.” County Fire continuously monitors all factors that contribute to the potential for large and damaging wildfires and staff our resources accordingly. Along with the Red Flag Warning program, the Chiefs discussed other prevention tools such as the Ready! Set! Go! program. “This program is about helping residents understand how their home’s location, surrounding vegetation, construction elements, and other factors place them at risk during a wildfire.” Fire Marshal Mike Horton said. 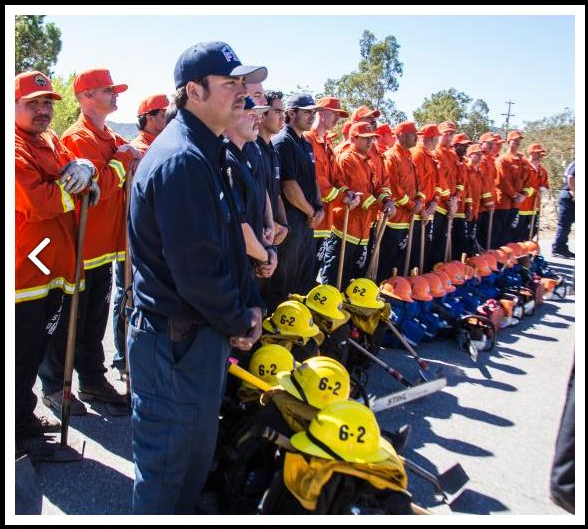 Defensible space, disaster plans, and evacuation preparedness all make up the Ready! Set! Go! program to help citizens protect themselves and their family. County Fire asks that you be our eyes and ears, our lookouts. If you see smoke or someone doing something that potentially can start a fire, call 9-1-1 and report it immediately. One spark is all it takes to start a devastating wildfire, especially during a Red Flag warning. Learn how you can be prepared, visit our website at www.sbcfire.org. Courtesy photos from Monday’s press conference can be located at www.sbcfire.org under latest news. Join the San Bernardino County Museum as we prepare the Inland Empire for the Great California ShakeOut Earthquake Drill. There will be free museum admission on Oct. 11 from 10 a.m. to 3 p.m. Experience the “Big Shaker” an interactive simulation vehicle, educational speakers and guest lecturers, safety vehicles and exercises preparing you and your family for an earthquake. There will be giveaways, museum tours, children’s performers, crafts and more. Click here for details on the Museum event. Don’t forget to register to participate in the Great California Shakeout at 10:16 a.m. on October 16. Visit www.shakeout.org/California for more information on participation. In an effort to increase the public’s understanding of the services available through County government, the Board of Supervisors today approved a new visual identity for the County and its various agencies, departments, and divisions. “Having a consistent visual identity will help residents know which services are provided by County agencies and know that the County is responsible for making sure those services are provided competently and efficiently,” said Board of Supervisors Chair Janice Rutherford. Until now, County government has been represented for the most part by an arrowhead-shaped seal containing depictions of the county’s resources and geography. Over time, each of the County’s more than 50 agencies, departments, and divisions have adopted their own separate visual identities, sometimes making it unclear that these entities are all part of the same County organization. Earlier this year, the Board of Supervisors publicly adopted goals and objectives for the County, including a call for consistent messaging for the organization and elimination of barriers between departments in order to foster collaboration. The new visual identity – consisting of a logo, color scheme, and typography – maintains use of the historic arrowhead as a recognizable symbol of the county. It will represent County government on letterhead, websites, social media, vehicles, uniforms, business cards, and buildings. It was created by County staff and its use will be phased in to avoid incurring additional costs. The historic County seal will remain in use only as the County’s legal insignia to be stamped on official documents. You’ve seen earthquakes depicted in movies where the ground opens up and swallows people and cars and homes into a large, gaping hole. The ground moves across a fault during an earthquake, not away from it, according to the Earthquake Country Alliance. If the fault could open up and devour people and objects, there wouldn’t be any friction meaning there wouldn’t be an earthquake. There’s no doubt earthquakes are dangerous. Get more information about earthquakes at earthquakecountry.org before the next earthquake hits so you can be prepared. Don’t forget to register at shakeout.org/california for the Great California Shakeout at 10:16 a.m. on October 16, 2014. The San Bernardino County Elections Office is participating in National Voter Registration Day on Tuesday, Sept. 23 by accepting walk-in registrations until midnight and by distributing voter information displays throughout the county. National Voter Registration Day is the country’s largest single-day effort of the year designed to register voters, which is the first step to becoming involved in the political process. Now in its third year, more than 350,000 voters have registered through the efforts of more than 2,100 partners who have participated in National Voter Registration Day events. 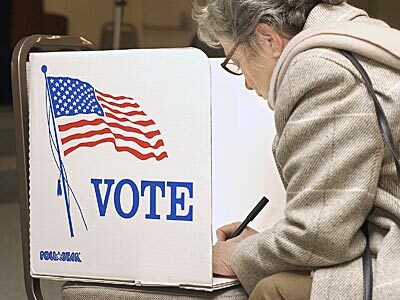 Citizens may register to vote one of two ways: online or in person. Voters can register online at www.sbcountyelections.com. Voters may also obtain a paper voter registration application at one of the 91 new sites hosting Elections Office Voter Information Displays throughout the county, or at the Elections Office, 777 East Rialto Ave., San Bernardino. In addition, applications are also distributed to clients by 82 governmental agencies in San Bernardino County. On Tuesday, Sept. 23, the Elections Office will release interactive maps on their website to help voters find local participating agencies where they can pick up voter registration applications, poll worker applications, mail ballot applications, and applications for electronic voter information guides. For more information about the San Bernardino County Elections Office, visit www.sbcountyelections.com, or call 909.387.8300. For more information about National Voter Registration Day, visit www.nationalvoterregistrationday.org. 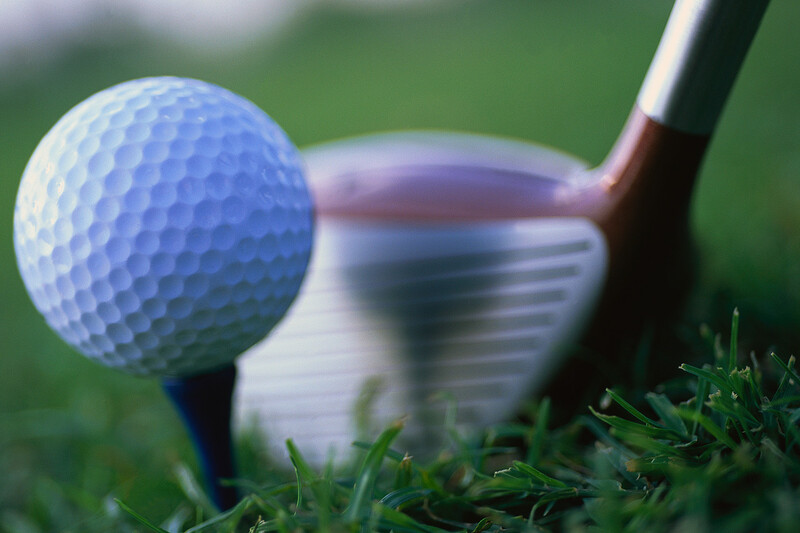 The 5th Annual Charity Golf Tournament benefitting children and families will be held Oct. 24 beginning at 9:30 a.m. at Tukwet Canyon Golf Club, 36211 Champions Drive, in Beaumont. CASA of San Bernardino, the San Bernardino County Public Defender and Enhancing Forward Action, Inc. are hosting the tournament in a collaborative effort to raise funds to enhance the lives and advocate for our community’s children and families in the areas of stability in foster care, hope, and obesity prevention with fitness and nutrition. It is our hope that you share the same desire and dreams for children who are in much need of an opportunity to become successful, productive, and healthy citizens in our society. If you are an active military service member or a veteran, apply today to win a home in Lake Elsinore. The home is being donated by HomeStrong USA. Applications need to be received by October 3, 2014 to be considered for the donation. For more information contact Community Development and Housing at 909/387-4389 or to apply click here. The home will be presented on November 8.